Frantz Group is proud to present a webinar series on improving inbound marketing analytics for B2B organizations, designed to give you a better picture of what is happening on your website and allow you to improve your website results. We welcome you to enjoy our overview presentation available here. Please register below to view the additional sessions. Want to have a consultation regarding your specific website and what steps may help? Feel free to call us at 800-707-0064 or check the box on our webform to receive a call back. Frantz Group offers a variety of inbound marketing solutions that may meet your needs. Currently, the series covers the following topics, and is set up in 5-10 minute recorded sessions. The content includes slide materials as well as actual web based examples. With registration, we will include copies of the presentations to download, with helpful content links and examples. Future topics will be made available soon including: Linking to Adwords and Effective A/B Testing. We will notify subscribers to the availability of content as it is released. Overview: Is our website getting more visitors? Is our revenue increasing? These questions represent the bookends of inbound marketing and website results. The challenge is, how do they relate? More visitors do not necessarily mean more revenue, and frequently companies aren’t properly assigning source codes to revenue generating opportunities so they would know if the two elements were related. For most marketing efforts, we have an expected spend, along with a series of metrics that show results throughout the marketing process. 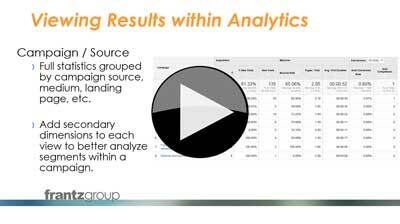 In this webinar series, we look to examine methods to better view your inbound marketing data with an emphasis on understanding how website results and changes can be measured. We look to help demystify the steps between website visitor and booked revenue, and extend the view of website measurement to include campaign tracking for email marketing and ad placements. Having an integrated view of your website performance across a variety of marketing tactics allows you to more easily assess which content is performing well along with measuring how effective various programs were that drove traffic to your site. Our focus for this series is on Google Analytics, primarily because it is free, and already running on many sites around the web. However, the concepts contained within can be applied to a variety of tracking packages and marketing automation solutions. Mechanically, all sorts of tracking is possible with your website and online environment. An analytics package is simply a tool to help represent data around website measurement. Learning simple ways to use the tool will help you measure the changes you make to your website, going beyond just visits, by learning to track goals, interactions, conversions. Along the way, we’ll discuss easy ways to integrate with adwords, as well as methods to regain some visibility to SEO traffic and performance. If you’ve already upgraded your site to Universal Analytics, then please check our post about how the code to support the page view tracking has changed.